Guitar method books of today tend to focus on technique of a purely mechanical nature. 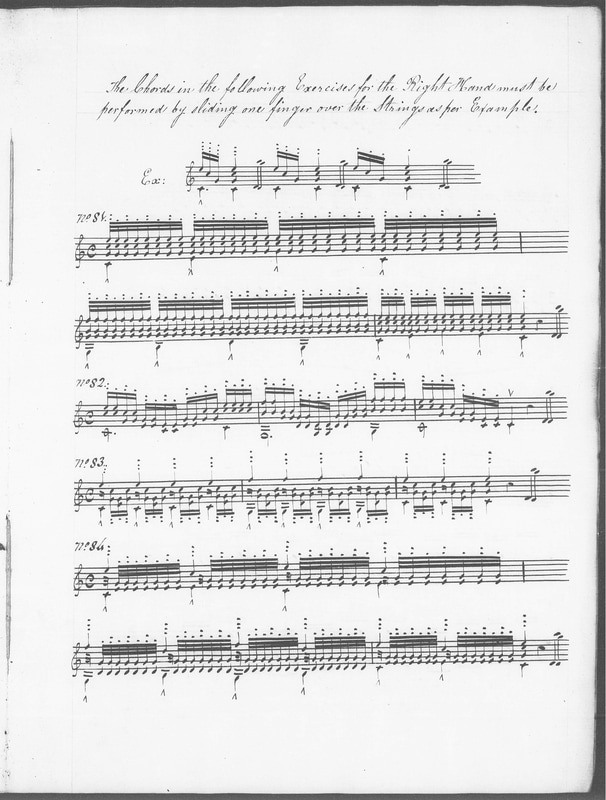 What you might have noticed about the previous 19th century method books is that they are full of musical exercises - scales, chords, arpeggios, etc. 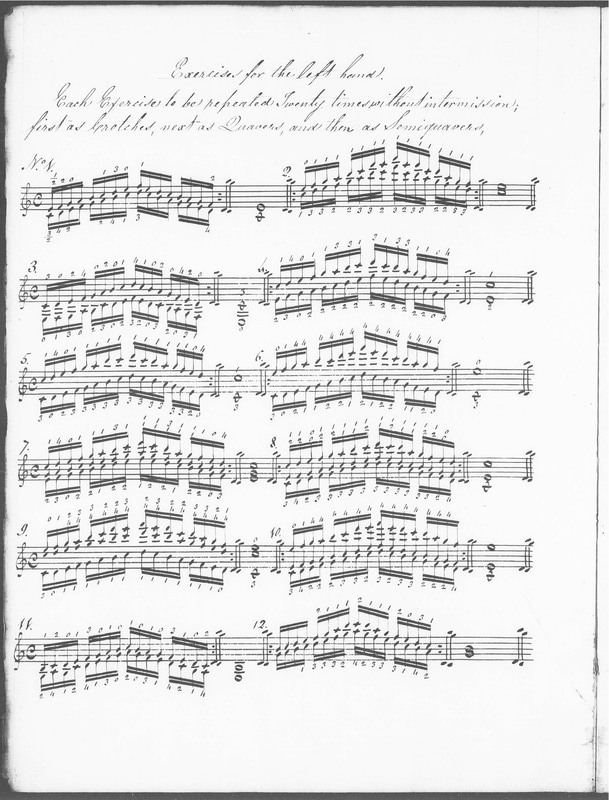 This suggests that guitarists of the 19th century were very musically literate, and had great understanding of harmony on the guitar. I've found from experience that these musical exercises make for great, if not better, technical exercises than the purely mechanical ones. These method books are also great because guitarists of all levels can get enormous value from them, even though they were written mostly for amateurs (although the concept of an amateur has changed somewhat since then). The books are full of great info, exercises, and pieces, and shed light on how 19th century guitarists, including Sor, Giuliani, Aguado, etc., thought about playing. I'm sure a lot of you have played music by 19th century composers. If you study these method books, your understanding of that style will increase dramatically. Unfortunately, the performance practice of this era is often misunderstood, to the point where guitarists actually play and teach the opposite of the conventions found in these books. I hope this misunderstanding will soon change, and I hope you will all be a part in making this important change happen in the world today - please spread the word in your playing, teaching, conversations, etc!! You'll find that the knowledge and conventions found in these books makes the music of Sor, Giuliani, Carulli, Carcassi, etc. a lot of fun to play. Classical music could sure use a bit more fun these days! Have you had a look through the last two method books? I would love to hear what you think about the method books so far - please shoot me a message! This week's resource is again a method book by Ferdinand Pelzer. If you want to skip all my fluffy commentary, please scroll down to the bottom to download the method book. Pelzer (1801 - 1860) was born in Mülheim, Germany. 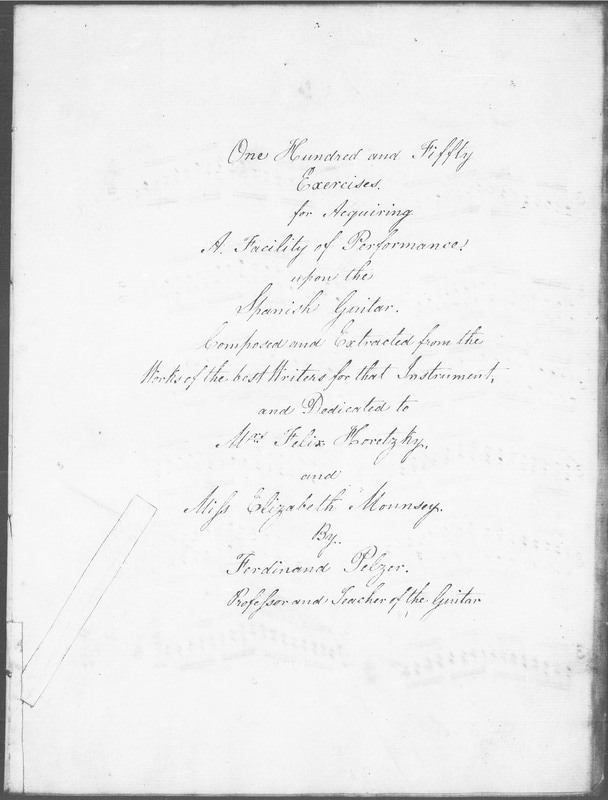 He moved to England in 1829, and eventually became the editor of the Giulianiad - an early guitar journal. I am currently attempting to find digital copies of this journal, so if anyone knows where to find them, please let me know. Wikipedia says that Pelzer "wrote many short compositions and arrangements for solo guitar as well as guitar accompaniments to popular songs." 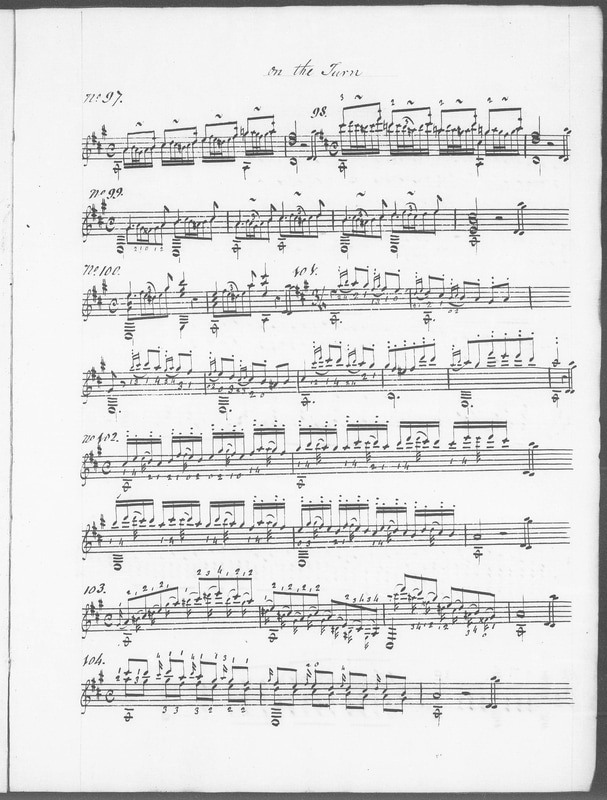 However, I have found several substantial pieces that are quite lengthy and highly virtuosic. This method book is quite short (just shy of 30 pages) and contains little writing. It's in handwritten form, perhaps suggesting that Pelzer never got it to the printers. I'm sorry to say there are no page numbers, but each exercise is labeled with a number. 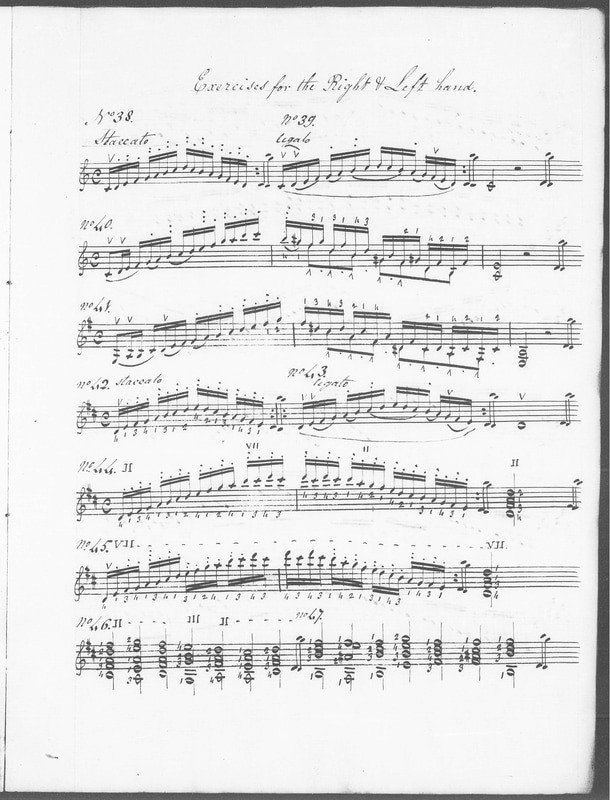 The book begins with some harmonized scales, which are really useful to practice as you find them everywhere in pieces. See if you can find similar figures in the pieces you're working on. After this section, the book becomes a bit of a mixed bag. 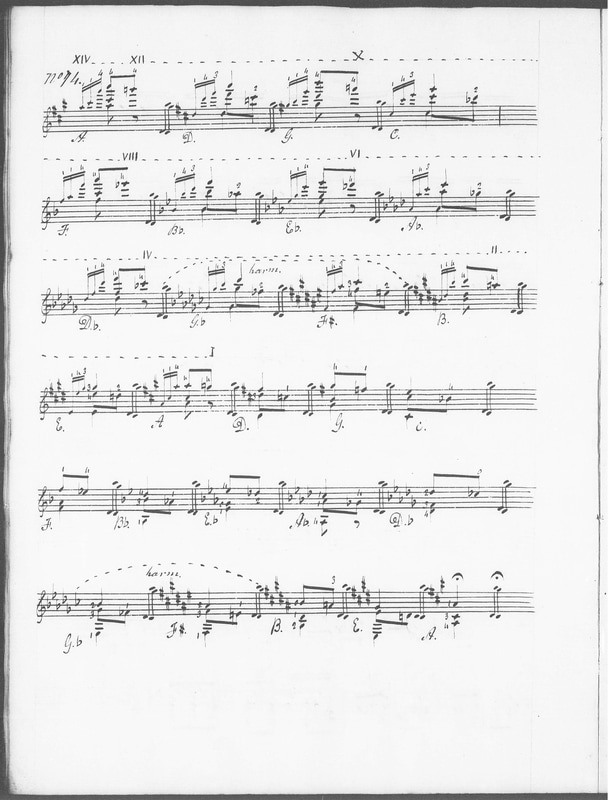 The following section, titled Exercises for the Right & Left hands, begins with scales in mixed articulations. If you're practicing scales, try and apply some of these patterns! Do the same if you find scale passages in 19th century pieces. This is true performance practice - experimenting with information found from sources! This next highlight is a bit more advanced, and focuses on modulating through the circle of 4ths, starting on A and ending on A. Some very cool right hand arpeggios can be found later on - move over Giuliani! 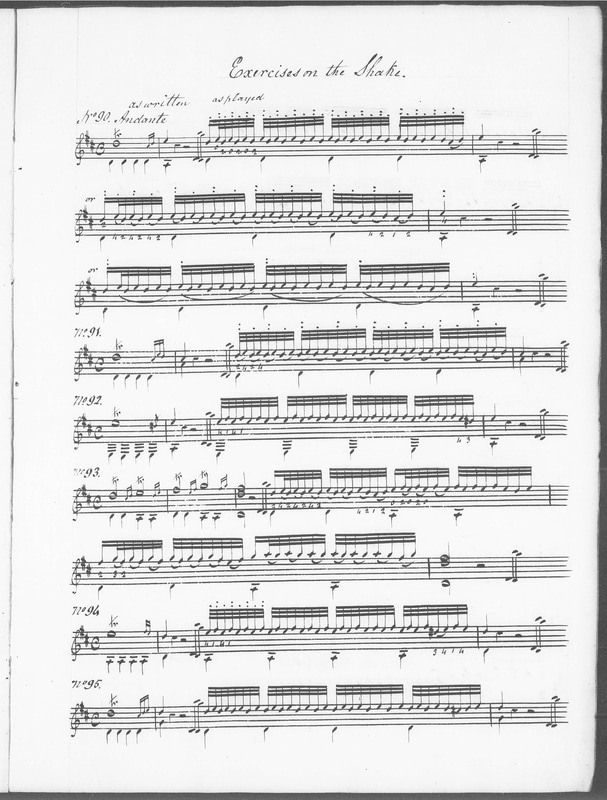 There are also a few pages of exercises for ornamentation. Keep in mind that the trill was often called a shake. The page marked "on the Turn" also contains ornaments other than the turn. Can you identify what they are? - I'm talking about exercises 101 - 104. The book concludes with some lovely pieces and extracts. 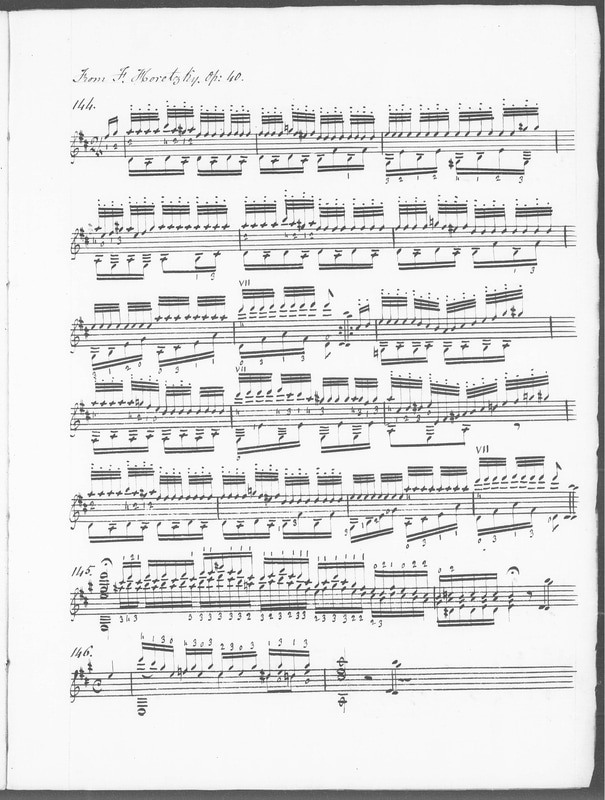 One of them was composed by Felix Horetzky (doesn't it look like fun?! ), who will be the topic of a future email.